Energy efficiency – Any window you’re considering for your installation project should have features such as foam insulated sashes and frames, gas fills, Low-E glass coatings, and spacers, which all contribute to optimal thermal performance. Versatility – Make sure that you partner with a window installation company that offers windows in several different colors, grid options, and styles, including bay, boy, casement, double hung, awning, and more. Maintenance – Look for windows that are resistant to rusting, corroding, chipping, and peeling, so they continue to look like new for many years to come. Your windows should also be available with tilt-in options that allow you to clean the sashes with no fuss. 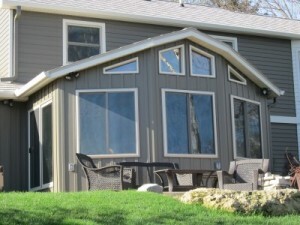 At ABC Seamless Home Specialists, we can provide you with the best window installation services in the Madison, WI, area. We offer windows that are made of unplasticized virgin vinyl for superior strength and durability. They have features such as a triple pane glass package and warm edge Super Spacer® that make them more energy efficient than the competition, and they’re also available in numerous customizable styles that will provide a unique look that’s sure to complement your home. To learn more about the window installation services we provide to homeowners in the Madison, WI, area, contact the professionals at ABC Seamless Home Specialists today.